Donald Trump’s announcement came hours after North Korea carried out what it said is the demolition of its nuclear test site. 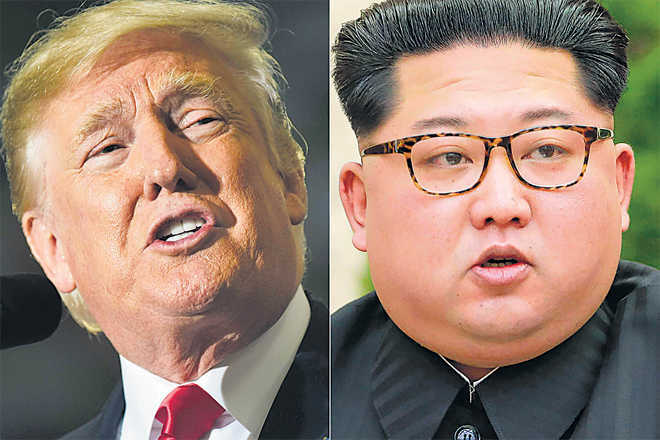 US President Donald Trump on Thursday called off a historic summit with North Korean leader Kim Jong Un scheduled for next month, even after North Korea followed through on a pledge to blow up tunnels at its nuclear test site. Trump announced his abrupt withdrawal from what would have been a first-ever meeting between a serving US President and a North Korean leader in Singapore on June 12 in a letter to Kim. A White House official said a North Korean official’s condemnation of US Vice-President Mike Pence as a “political dummy” was “the last straw” that led to cancelling the summit. “Sadly, based on the tremendous anger and open hostility displayed in your most recent statement, I feel it would be inappropriate, at this time, to have this long-planned meeting,” Trump wrote to Kim. “Please let this letter serve to represent that the Singapore summit, for the good of both parties, but to the detriment of the world, will not take place.” Trump called it “a missed opportunity” and said he still hoped to meet Kim someday. However, the chances for a quick rescheduling appear remote and cancellation of the summit will renew fears of a return to conflict on the Korean peninsula. The North Korean mission to the United Nations did not immediately respond to a request for comment on Trump’s cancellation of the summit. “You talk about your nuclear capabilities, but ours are so massive and powerful that I pray to God that they will never have to be used,” he said. Earlier on Thursday, North Korea had repeated a threat to pull out of the summit with Trump next month and warned it was prepared for a nuclear showdown with Washington if necessary. South Korea’s presidential Blue House appeared taken off guard by Trump’s letter and an official said it was “trying to figure out what President Trump exactly meant.” South Korean President Moon Jae-in had met with Trump at the White House on Tuesday to urge him to follow through on the summit and not let a rare opportunity with reclusive North Korea slip away.